How much time do you spend outside, completely surrounded by nature? Away from sidewalks, roads or anything else that shows human impact. For a lot of us this time in pure nature is very limited, but is so important. In nature we reflect, learn and relax. 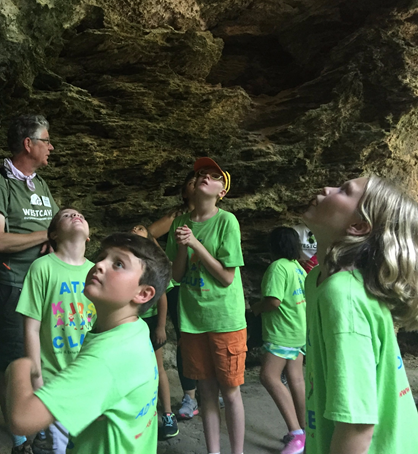 This spring, Westcave provided fully-funded school field trips to Title I schools in Hays County via funding from the Burdine Johnson Foundation. Field trips at Westcave Preserve provide an educational learning experience completely immersed in nature. For many students, this experience is the first of its kind. The guided field trip leads them down our Canyon Trail, through a lush, verdant canyon, and finally to the last turn of the trail when the Grotto reveals itself and leaves many with a gasped “WOW” on their lips. The students’ eyes dart around trying to soak in as much richness as possible as they point out curiosities to their classmates. The chatter of excitement and wonder fills the air. This experience is priceless and cannot be recreated by a photograph or on a screen. Students hear Westcave Preserve’s story of conservation, they ask questions to expand their curiosity, learn environmental science, take a moment of silence to listen to the natural sounds, and leave with memories that will last a lifetime. We aim to inspire students to continue to enjoy and explore nature. We can feel our impact when a student exclaims, “I have never been this far in nature before. This is awesome!”. Where will you find your next pure nature moment? Thank you to the Burdine Johnson Foundation for providing the funds to support these field trip experiences that will be remembered for a lifetime!